The National Advanced Driving Simulator - Why simulation? Simulation is a powerful tool for analyzing, designing, and operating complex systems. It enables us to test hypotheses without having to carry them out, saving both lives and money. It is a cost-effective means of exploring new processes, and provides a method for checking our understanding of the world around us, helping produce better results faster. 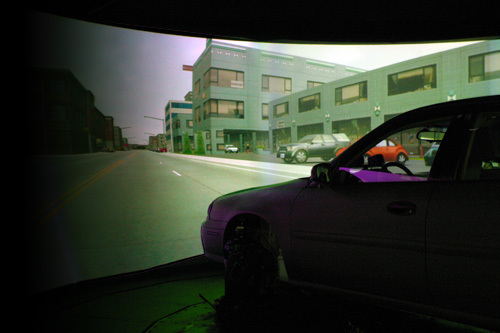 Simulation provides the ideal mechanism for exploring research that is infeasible, too costly, or unsafe in the real world, including assessing cognitive or physical ability, gaining understanding of driver performance and behavior, testing vehicle design in virtual proving grounds, and training drivers. The NADS offers driving simulators with a range of fidelities in order to best address the requirements for each project: NADS-1, the world’s highest-fidelity simulator; NADS-2, a fixed-base simulator; and the NADS MiniSim™, a low-cost PC-based portable simulator. Patients can be put into realistically risky driving situations, but with perfect safety. Because of the consistency of the simulator and the scenarios, one can be assured that, whether for research or evaluation, every patient can experience the identical conditions. Comparisons can be made across patients, facilities, time, date, illness, injury, or weather conditions. Can tailor the evaluation to the specific needs of the patient / individual. Lower cost than on-road studies. Simulators can be used 24/7. Not restricted by weather, time of day, etc. Results can be obtained faster than on-road; simulator studies typically have timelines of 3-12 months whereas on-road studies typically take 1-3 years. 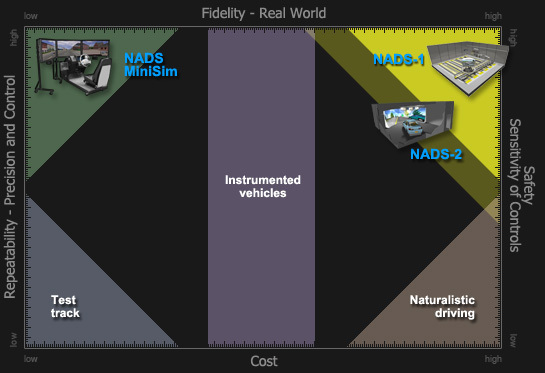 Simulation Fidelity - Where does NADS fit in? As fidelity increases, so too does the transfer of training and the accuracy of assessment, particularly among experienced or expert drivers. Lower fidelity simulation can be used for preparation and development of scenarios or study protocols without incurring the cost of high‐fidelity simulation platforms. Lower fidelity simulation is also ideal for new driver training where full immersion is not necessary. All NADS simulators are fully compatible with each other, allowing experiments developed on one platform to be seamlessly moved to another.